← Are You Prayin’ About It? 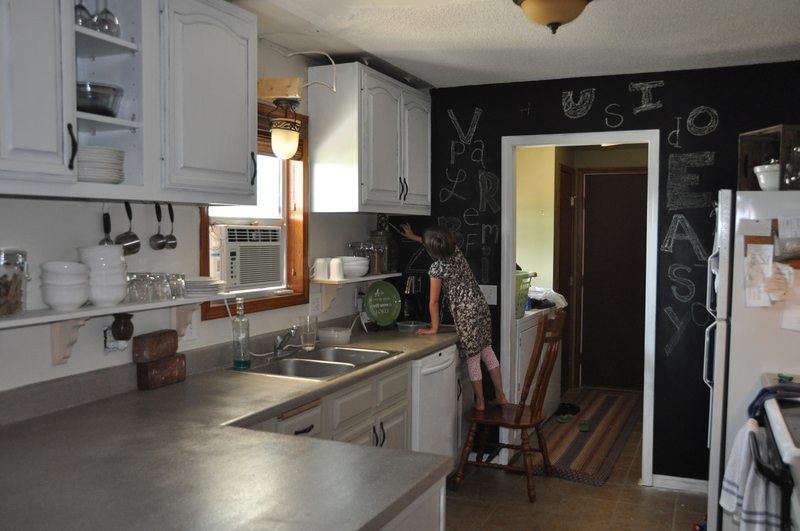 Kitchen Makeover: Backsplash, Shelving and More Painting! Now for the pictures that you have been WaiTinG for! 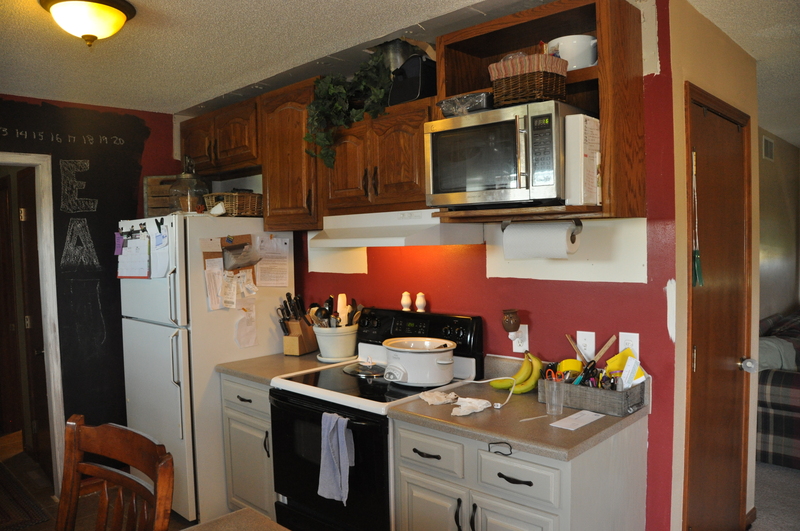 As I worked on painting the cabinets, I also added open shelving. Check it out! I bought the corbels at Home Depot and used MDF board for the shelves. 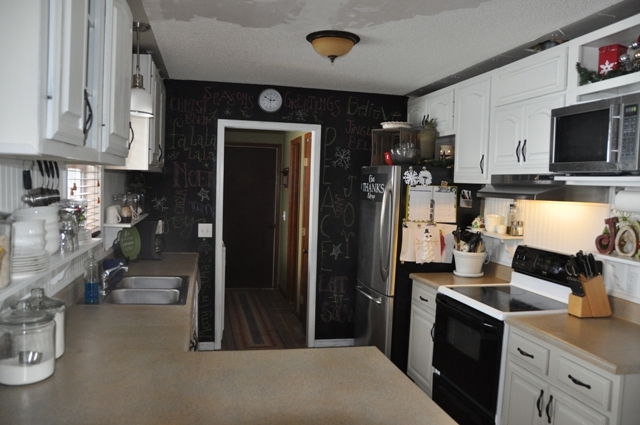 Next, I added a wainscoting backsplash, which I don’t have ANY pictures of that process (sorry!). But, I do have pictures of the nearly finished kitchen at Christmas! 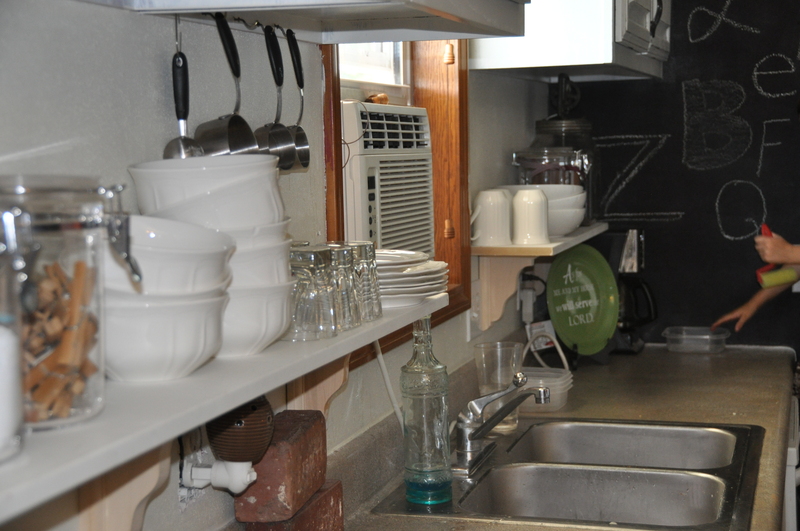 Here is an “after” picture (as of December 2012)! 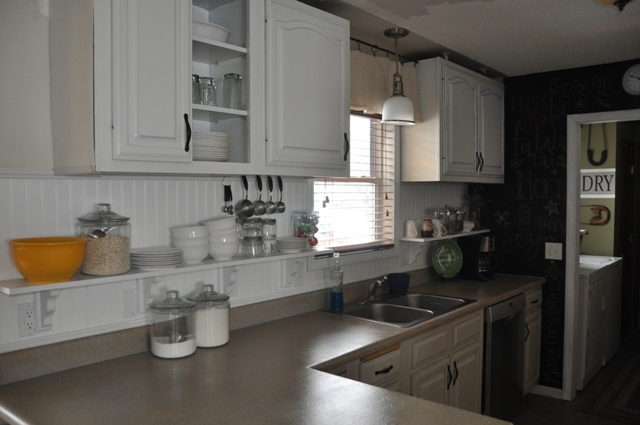 We added a new light fixture above the sink and painted the trim around the window. 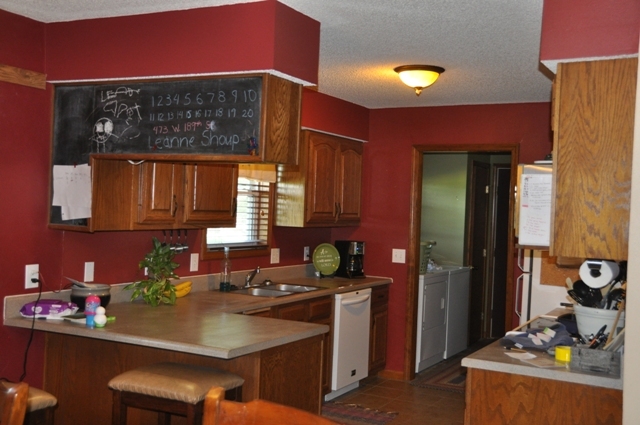 The trim, shelves, corbels and backsplash are all the same color. I used white trim paint from Sherwin-Williams. I took a cabinet door from a “lazy susan” cabinet that I bought on Craigslist. I cut the cabinet door down to size, and hung it. It opens from the bottom (the hinges are on the inside top) but I LOvE that it gives us extra storage space! The other big changes on this side of the room is a new fridge and range hood! 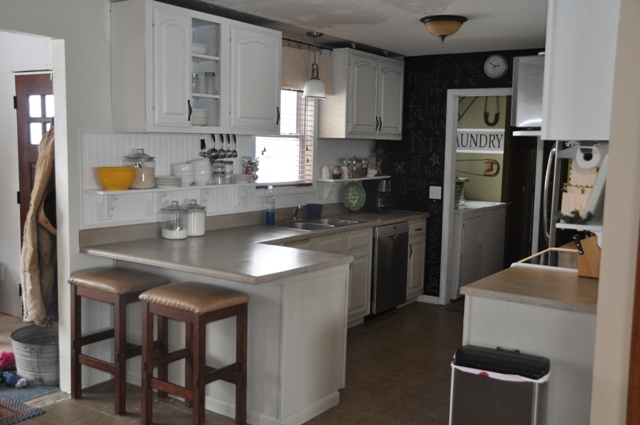 I also added wainscoting to the back of the open cabinets (the one with the microwave and the cabinet above it). This really prettied them up :) What do ya think?! 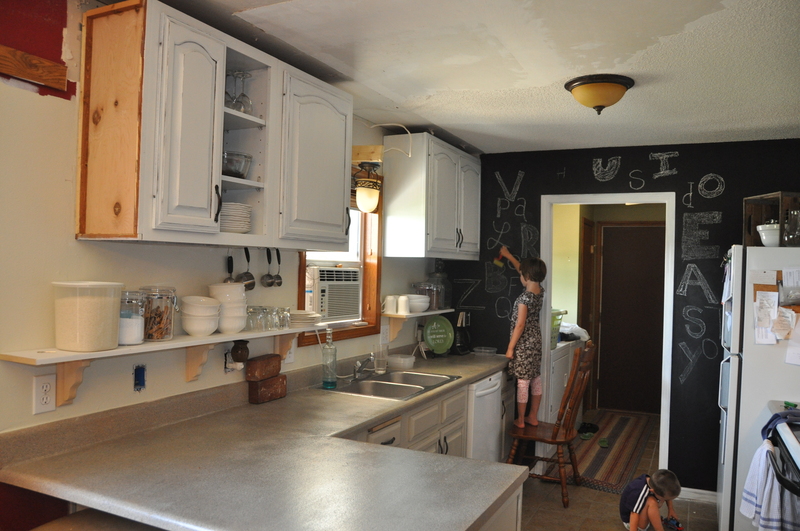 My kiddos are officially on sUmMer bReaK, so who knows when I will finish up the kitchen! We are so close though, and I am thrilled with the results! 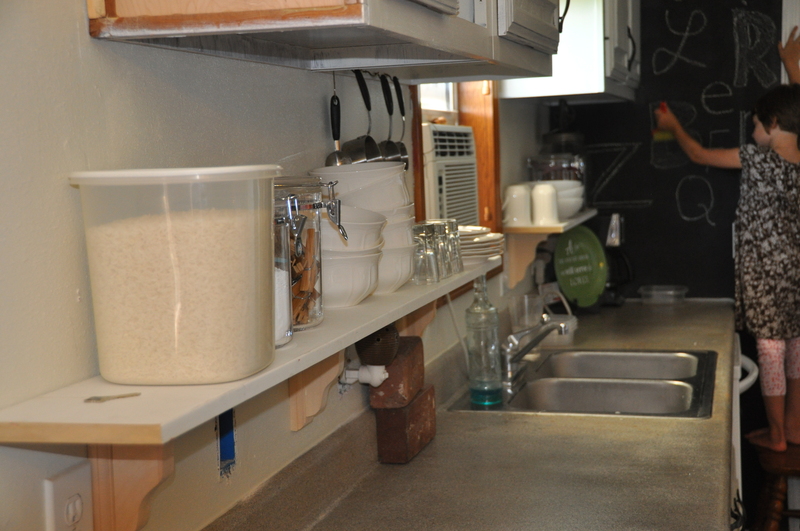 It has really opened up the space and feels like we doubled our cabinet space since we added the open shelving. Gotta love that! 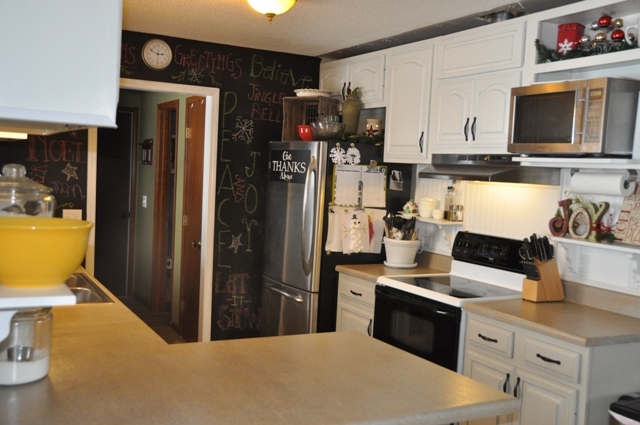 Let me know what you thought of the kitchen makeover! Looks great!!! You did a great job. I appreciate that, thanks Carolyn! I admire your “Think You Can” attitude! Proud of your “Can Do” attitude. Enjoy summer! Good eye on the laundry room ;) I was wondering if someone would notice! Thanks!! We love it too!! I am so glad I could help!! Thanks for reading!